Canada is a sheer ribbon with textured printed stars in silver or gold. Unwired with a cut edge, Canada will make voluminous bows with whimsical sparkle. 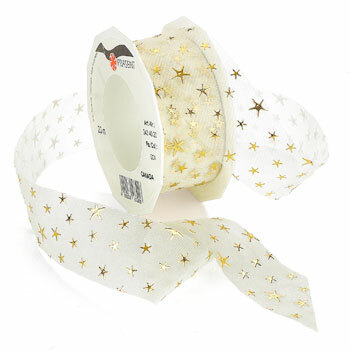 Add starry pizzazz to any craft, wedding décor or patriotic theme! Available in 11 colors and three widths.